It then shows a registration reminder dialog every now and then. When you have purchased バーコード君 from a distributor, you will probably have received OEM registration data. Because we compute your name and a six digit serial number into the match code, we cannot provide personal registration data to OEM resellers in advance. You can register your バーコード君 OEM license with the received registration data. Therefore you should use OEM xxxxxx as your name (where xxxxxx is your given serial number). After you have successfully unlocked your バーコード君 version with your OEM registration data, you may see another reminder dialog from time to time. The dialog is almost identical to the normal reminder dialog. It just reminds you to register with your personal information which we need to send you a computed personal match code. We recommend to register in order to get full support by us. 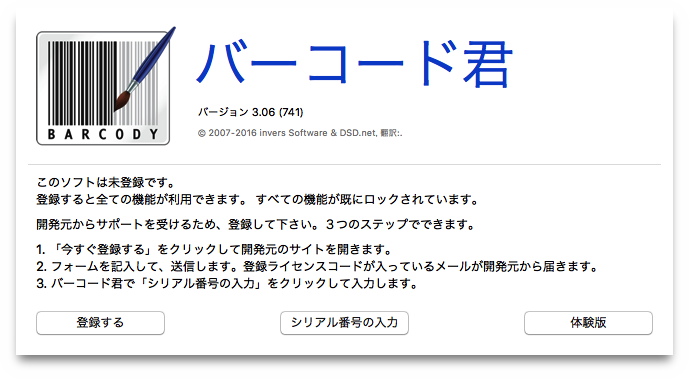 When you have purchased バーコード君 from the Mac App Store (MAS), it has automatically installed a fully functional MAS OEM version into your アプリケーション folder. In order to not disturb you when using a MAS version of バーコード君, chances are that バーコード君 will not show an OEM registration reminder dialog at all. If you want to get full support from us and maybe pick future updates from our website instead of using the MAS, we ask you to send us a purchase proof. 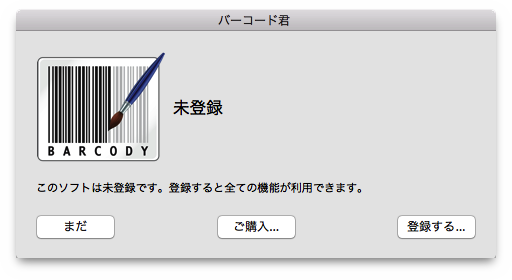 Simply send us the invoice which you received by Apple when you purchased バーコード君. Await our email with your personal match code data. When you have received it, register your copy of バーコード君 as described above.